In 2010, with Turkish assistance and sponsorship, Hamas launched the so-called “humanitarian flotilla” to break Israel’s lawful, and indeed, legally mandated, blockade of the Gaza coast. Hamas and Turkey deployed a mix of civilians and terrorists in civilian ships and boats to launch a suicide protest against Israel at sea. The 2010 flotilla was led by the massive Turkish cruise ship Mavi Marmara. Aboard the ship were 630 Israel-hating Westerners and 40 terrorists from Turkey’s regime-supported, al-Qaeda-allied IHH group. Rather than understand what Hamas was doing – reenacting the Corrie suicide protest on a larger scale – and acting to block the flotilla from setting sail, Israel chose to deal with the flotilla on its own terms. Ignoring the danger to its forces, the IDF sent naval commandos to interdict the ships and uphold the blockade of Gaza, armed with paintball guns. As the Western activists huddled in their cabins, IHH terrorists waited for the commandos on the Mavi Marmara’s deck. As they were lowered onto the deck from helicopters, the naval commandos were beset by IHH men who stabbed them with axes and knives and bludgeoned them with crow bars. Nine soldiers were wounded, three seriously. In the pitched, hours-long battle that followed, nine IHH terrorists were killed. And as predictably as the sun rising in the east, the Western media ignored the facts and attacked Israel. The Europeans condemned Israel. The Obama administration condemned Israel. Obama forced Prime Minister Benjamin Netanyahu to apologize to Turkish dictator Recep Erdogan who sponsored the assault. And Hamas received legitimacy and material concessions that enabled it to prepare its forces for the 2014 war it launched against Israel. Reasonably, after his great success with the Mavi Marmara suicide “protest,” Birawi was given command of the current suicide protest operation at the border. His basic concept of interspersing civilians with Hamas terrorists and using the former as cover for the latter and as cannon fodder is the common thread of both operations. If Israel had learned the proper lessons from the Mavi Marmara, things might have turned out differently on Monday. But from the looks of things, it learned all the wrong lessons. Once Birawi and his comrades successfully deployed 50,000 Gazans to the border, there was little chance of avoiding a significant death toll. That is, Hamas achieved its goals the minute it brought its people to the border. More than 60 Gazans were killed on Monday. But the outcome for Israel would have been the same no matter how high or low the casualty count. The media mouthed Hamas’s talking points. On cue, the likes of the BBC and The Washington Post accused Israel of wantonly and deliberately massacring children. Government officials rightly blame the media and the Europeans for the deaths of the civilians who were interspersed with terrorists along Gaza’s border with Israel this week. But the fact that the media are complicit tells us only one thing: Hamas is right to use the media. In other words, noticing the hostility of the media – and their politician comrades in the EU, Canada and the US Democratic Party – won’t get Israel any further along in developing the means to block Hamas from using its tried and true high card of suicide. Complaining about media hostility and professional negligence is not a strategy. It isn’t even a tactic. It’s a reflex. To understand what a strategy – or even a tactic – looks like, it is important to note two things. First, Hamas’s strategy is not risk-free. Second, Israel has its own to play. There are three inherent, and significant, weaknesses to Hamas’s suicide protest strategy. To understand the first, consider that on Tuesday, a doctor at Gaza City’s Shifa Hospital refuted reports that an infant had been killed due to tear gas inhalation at the border. On Wednesday, Hamas spokesman Salah Barawil said 50 of the 62 people killed at the border on Monday were Hamas terrorists. Why is Hamas minimizing civilian casualties? Doesn’t that undercut its goal of delegitimizing Israel? Hamas’s leadership feels it can minimize civilian casualties because it trusts the Western media to ignore its statements. And they are right to trust the media. Western media coverage of Hamas’s border campaign remained uniformly supportive of Hamas and hateful toward Israel even after the doctor and Bardawil acknowledged that Israel did not kill either children or a significant number of civilians on Monday. Hamas leaders were compelled to minimize reports of civilian casualties because the reports made their public turn on them. So the first weakness in Hamas’s suicide protest strategy is that Gazans don’t like it. Its second weakness is Egypt. Egypt – like Israel – recognizes that Hamas is its enemy. Hamas openly collaborates with the Muslim Brotherhood and Islamic State forces in Sinai waging an insurgency against the regime and threatening its very existence. According to Israel Hayom, Egyptian military intelligence compelled Hamas to end its border operation on Monday evening by telling Hamas leader Ismail Haniyeh that if he didn’t end the operation, Egypt would support Israeli efforts to target Hamas’s leaders. Whereas Turkish President Erdogan has led the charge against Israel in the Islamic world over Hamas’s suicide campaign along the border, the Egyptians and the Saudis have been supportive of Israel’s efforts to end the operation. Hamas’s third weakness is the Trump administration. Whereas the Obama administration supported Hamas (and Turkey) against Israel during the Mavi Marmara operation, the Trump administration has been unstintingly supportive of Israel and placed all the blame for the deaths along the border on Hamas. The confluence of Egyptian and American support is new and it provides Israel with new opportunities. So given Hamas’s weaknesses, what can Israel do to undercut its suicide protest strategy? Since Hamas wins the minute it successfully deploys its suicide protesters, the first focus of Israel’s efforts should be the development of the means to prevent the protests from taking place in the first place. In 2010, rather than send paintball-armed commandos to commandeer the Mavi Marmara, Israel should have sent them to Turkey and Cyprus to prevent the ships from setting sail. Israel has taken such actions in the past. But it appears the current crop of generals lacks the audacity of its predecessors. This must change. Similarly, in the countdown to Hamas’s initiation of its suicide protest border campaign, the IDF threatened to sanction Gaza bus companies that transport protesters to the border. Not surprisingly, the bus operators prefer to take their chances with Israel than risk their lives with Hamas. A better plan would have been to disable the buses. So, too, how many Gazans would have approached the border if the area were covered in animal and human feces on Monday morning? These actions are minimally invasive, nonlethal and highly effective. Since Hamas wins the minute the suicide protester dies, Israel needs to prevent them from gathering. During Operation Protective Edge, Hamas’s 2014 war against Israel, the Egyptians, Saudis and the UAE were as supportive of Israel as Egypt has been this week, and for the same reason. They view Hamas as an existential threat to their regimes. But their support only took Israel so far, because the Obama administration, which supported Hamas, sought to replace them as mediators with Hamas’s sponsors Turkey and Qatar. Today, with the Trump administration firmly supportive of Israel – and Egypt – the government and the IDF have the opportunity to consider further options for weakening Hamas’s grip on power. Depressingly, rather than weigh its actual options, the IDF has renewed its call to bring in further humanitarian aid to Gaza, apparently thinking that doing so will diminish media criticism. But the reason there is a humanitarian crisis in Gaza is that the Hamas regime has created and escalated and perpetuated it. So long as Hamas controls Gaza, Gaza will be steeped in a humanitarian crisis. 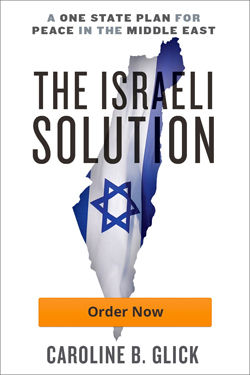 Israel’s efforts to mitigate it, like its efforts to convince The New York Times to report the truth, are a futile waste of time, resources and energy. This brings us to Israel’s Western antagonists. British Foreign Secretary Boris Johnson and his comrades are right to bemoan Gaza’s humanitarian condition. But Israel can’t do anything about it. When the IDF offers humanitarian assistance to Gaza, it is playing the sucker role Hamas has given it. When Israel offers humanitarian assistance, it is presenting itself as capable of ameliorating a situation it didn’t cause, hasn’t contributed to and cannot fix. It is time for Israel’s leaders, including the IDF, to stop being suckers. Rather than sending more truckloads of cement and food, used to build attack tunnels and feed terrorists, Israel should say it shares Johnson’s concerns and thinks it would be fantastic if Britain, and France and Germany and Canada, would give refuge to the suffering Gazans. Israel could facilitate their transit. Israel doesn’t have to keep letting Hamas win. It has weaknesses. We have options. It is time that we start using them.